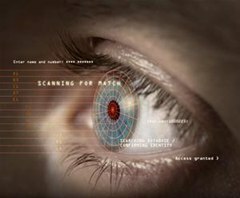 DARPA and Dallas's Southern Methodist University are collaborating on a super high tech camera, capable of scanning eyeballs in a moving crowd. "Called Panoptes, the devices use low-resolution sensors to create a high-res image that can be captured using a lightweight, ultra-slim camera. Because they don't use a lens, the cameras were originally designed for miniature drone sensors and troop helmet-cams. It'll eliminate problems like glare, eyelashes, dim lighting — and an unwillingness to stop and stare directly into a dedicated iris-detection camera. Instead, Panoptes devices will zero in on a face, no matter angle or movement, then narrow right into the iris. A long line of people, moving through a line, could be scanned by wall-mounted cameras and they wouldn't even notice it was happening. 'Ideally, when you walk down a hallway, no matter where your head is looking, the device can grab your eyeball and detect what it needs to,' project leader Professor Marc Christensen said. And where possible security and defense applications are concerned? 'You can let your imagination fly with that one...'" (Read more). Moving beyond the inevitable Big Brother theories, this technology promises pretty sweet advances, in addition to eyeball scanning. Christensen proposes that the camera-projection device could be incorporated into phones, which would enable the consumer to "photograph the page of a book down to the smallest lettering, or detect counterfeit cash by picking up the texture of a $20 bill." Previously, Shh...Cyborg Spy Beetles Released by DARPA. hey it feels like that movie i saw once. The future is now! Would sunglasses block it?